Hello! Welcome to the very first D's Team USA Blog Hop. If you've been hopping or skipping, you should have landed from Megan Thompson's blog. Wasn't her card beautiful? As you probably know by now, our Hop Theme is Fall or Halloween this month. Once again, I have used my favorite new Fall themed set, Lighthearted Leaves. I know, I know, I keep using this set. But what can I say, I love it! So I've done several techniques with this set previously. 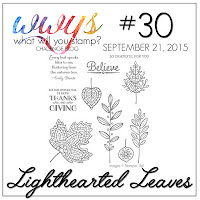 I had my heart set on watercoloring this gorgeous maple leaf but I didn't want to use a harsh ink on my beautiful photo polymer stamps. Then it hit me, I can clear emboss the Stampin' Up! Classic Ink. Yay! Problem solved! 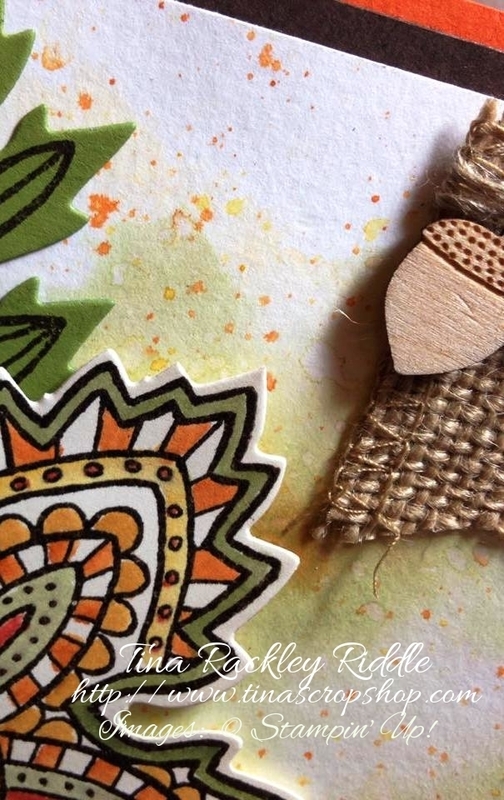 I stamped this gorgeous leaf with Early Espresso Ink onto Very Vanila cardstock and then immediately clear embossed. Once embossed and dried, I watercolored it and cut it out using the Leaflet Thinlit Dies. My second leaf was stamped in Early Espresso onto Old Olive Cardstock and then cut out as well. The background was a reverse smooshing technique on watercolor using a few different colors. I used my aqua marker to make so splatters of various inks on the background after it had been dried. Here's a close up of some of the splatters. Next on our Hop is the fabulous Sue Parker's blog! I know you won't want to miss her awesome card! Just click the next button and you'll be there! Good Morning! Have you ever looked at colors in a color challenge and wondered why you hadn't thought of those colors together? That's exactly what I did when I saw the banner for this week's SIP Color Challenge! How gorgeous are these together, right?? There are so many possibilies but I decided to pull out my favorite sentiment set, Feel Goods, and do a simple Reverse Smooshing background. Reverse Smooshing.. yep, that's what I said. How fun is that?? 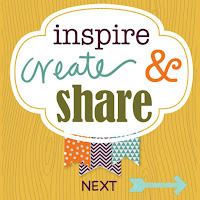 I saw such a fun quick tip tutorial on it on an email from Unity Stamp Co. The quick tip came from Heather Hoffman. If you don't follow Heather, I can tell you right now, she is Fabulous!! Now, I've Smooshing for a while now but I had never Reverse Smooshed... well now I'm hooked. lol So here's how it's done... I started with a 4 x 5 1/4" piece of watercolor paper. I heat embossed my sentiment in black embossing powder first. Then I laid a piece of wax paper over my card front and pushed my ink directly onto the wax paper (remember it will be reverse from where you are putting it now). Once I had applied both colors of ink, in this case Daffodil Delight and Pool Party, I spritzed the card front a few times and then placed the wax paper ink side down onto it. Rub your hands over the back of the wax paper to apply the ink and allow it to smoosh out. That's it. How easy is that! I mounted it onto a Basic Black card base, added a few Pretty Pink Posh sequins and called this one done! 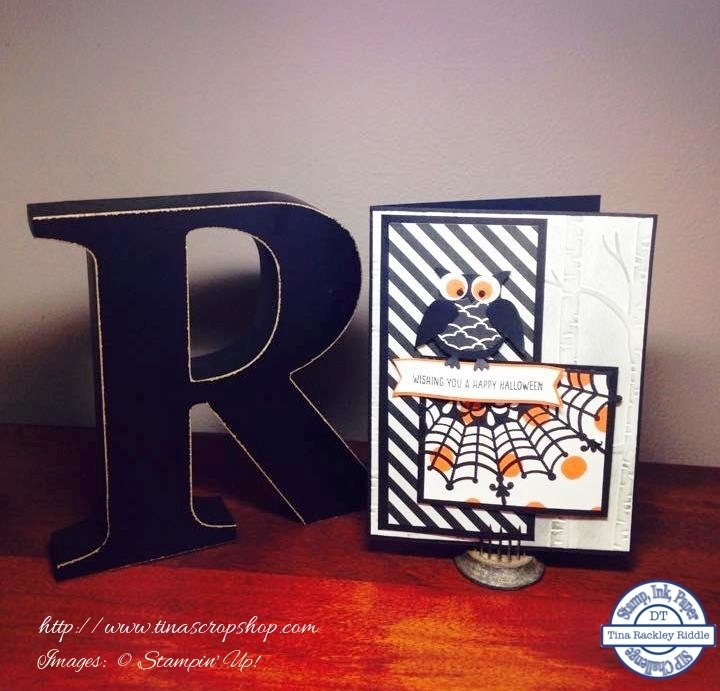 Hello and welcome to Stampin Friends Everything Fall Blog Hop! I'm so excited to be a part of this hop and I know that you'll have a blast checking out all of the talent here! If you've already been hopping along you should have landed here from Elizabeth's blog. If you missed it you will definitely want to go back and check it out so just click the Previous button at the top of the page. This month we have three fabulous Guest Hoppers: Barbara Welch, Kim Smith, and Maria Willis! These are three super talented ladies and you'll definitely want to check them out along the way! 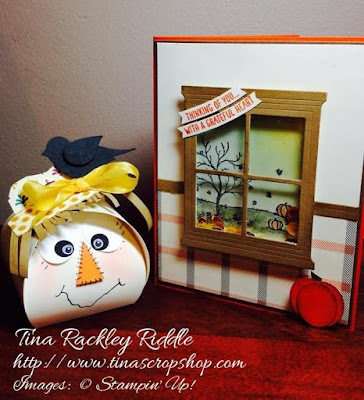 I chose the Happy Scenes stamp set and the coordinating Hearth & Home Framelit Dies for my card. From the first time I laid eyes on this Window Framelit, I knew I wanted to make a shaker card. I started with a Tangelo Twist A2 card base. I added a layer of 5 3/8" x 4 1/8" piece of Soft Suede Cardstock. My top layer is Very Vanilla with the bottom portion Happy Haunting DSP. I cut the window out twice in Soft Suede cardstock so that I could cut some of it off to use as a chair rail to seperate the Vanilla top and the plaid/wallpaper bottom. 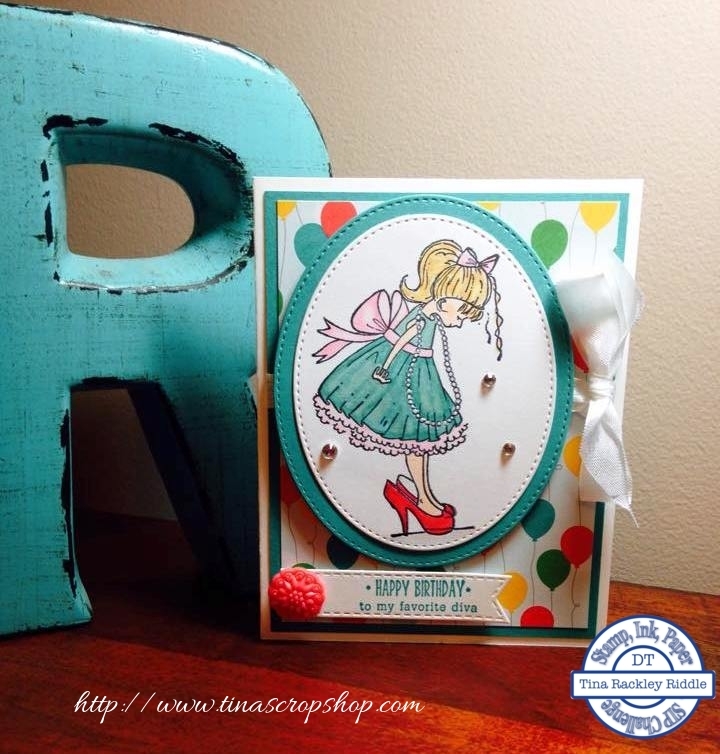 The scene was created on Very Vanilla cardstock and was colored in with Stampin' Markers and blender pens. The sky portion was sponged in with Soft Sky and Daffodil Delight in the upper right corner. I adhered the Window Sheet to the back of the window die cut and added two layers of Foam tape so that I had plenty of room for some Pretty Pink Posh yellow, orange, and gold sequins. The sentiment also from Happy Scenes was curved on the acrylic block before stamping in Tangelo Twist onto the Very Vanilla Cardstock. I cut the two lines apart and banner cut the ends to layer in the upper left corner of the window. The pumpkin at the bottom of the wall was punched from three small ovals with the edges sponged with Soft Suede Ink. I hand cut a little stem from Soft Suede cardstock to glue to the back of the pumpkin and then adhered it to my card with dimensionals. For my project I had a dilema. 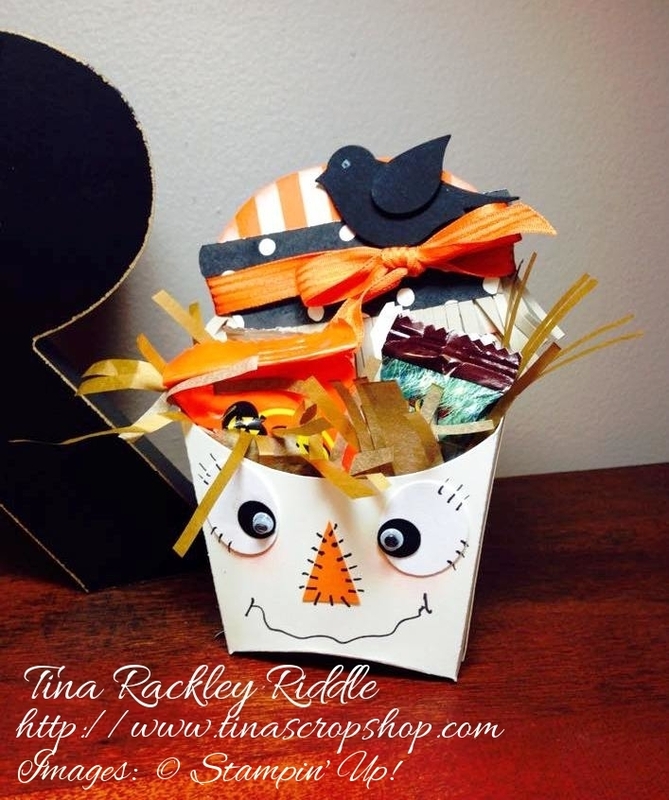 I knew I wanted to make a scarecrow treat box for my Granddaughters. I made two different kinds and I'll let you decide which you prefer. 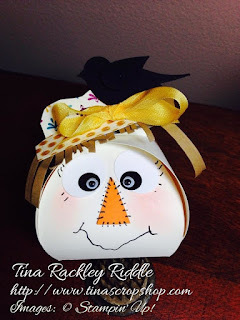 First I had a Curvy Keepsake Scarecrow Box and then a Fry Box Scarecrow. What would be your pick? Since I didn't have any raffia on hand, I can tell you that the Fringe Scissors were awesome for making the scarecrow's hair. For the fry box I even put a little gift tissue paper in the box and used the fringe scissors on it! Thanks so very much for stopping by! The next stop on our Everything Fall Hop is my good friend, the very talented Andrea Tracy-Tucker's blog. Just click the next button and you'll be there! 2. Tina -- You are here! Good morning! I've had such a great weekend and am ready for a great week! 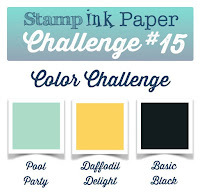 Since it's Tuesday, that means another Stamp, Ink, Paper Challenge! This week we have an awesome sketch! I know you can take this one and run with it! There are endless possibilies with this sketch for sure! I bought some Halloween doilies and paper in a group share (Thanks Regina!) since I don't use a ton of Halloween stuff. This was just the perfect amount of goodies to get the cards made that I wanted to make. For my card today I started with an A2 Basic Black card base. I added a 5 3/8" x 4 1/8" piece of Very Vanilla cardstock that has been embossed in the Woodland Textured Impressions Embossing Folder and then sponged with some Smoky Slate Ink. The larger rectangle on the left side of the card had a mat of 5 1/8" x 2 1/2" Basic Black cardstock and a layer of Typeset DSP that measured 4 7/8" x 2 1/4". The smaller rectange had a mat of 3 x 2 1/2" Basic Black DSP and a layer of 2 3/4" x 2 1/4" Happy Haunting DSP. I added a section of the new Black Spider Web Doilie. Using the Owl Builder Punch I punched out a Owl in Basic Black. I used more of the Happy Haunting DSP for his middle. His eyes were Very Vanilla, Tangelo Twist, and Black. I punched out two wings with the Bird Builder Punch and gave them a little bit of a jagged trim before adhering them to my owl. My Sentiment is from the Happy Scenes Stamp set and was stamped on Very Vanila with a Tangelo Twist mat and I cut banner ends in both with the Banner Punch. 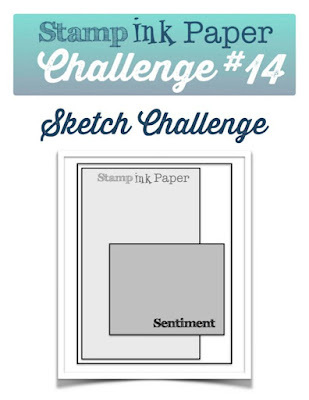 up your own Sketch Challenge Card this week! I'm stoked! 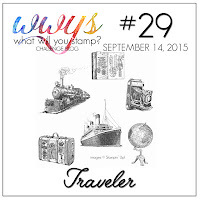 WWYS is having a Traveler Challenge! What??? I LOVE the Traveler Stamp Set. Seriously I must have 10 cards blogged from this set! 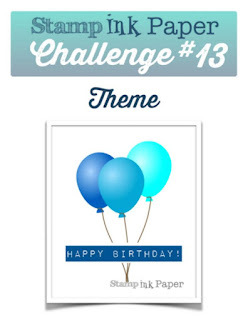 Here's the banner for the Challenge! I started with an A2 cardbase of Basic Black, My next layer was Very Vanilla Cardstock 5 1/4 x 4" and then a 5" x 3 3/4" piece of the Map Paper from the Typeset Specialty DSP. The Train Image was stamped with Memento Tuxedo Black Ink onto Very Vanilla Cardstock and cut out with MFT Stitched Circle Dies. I also cut a map of Basic Black with one of the larger MFT Stitched Circle Die. 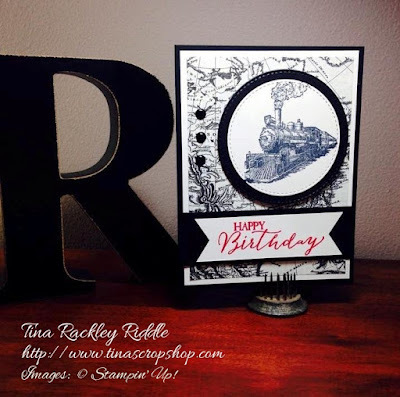 I glued the Circle with the Train onto the Black Mat with Tombo Multipurpose Glue and then adhered the double layers onto my Map paper with Stampin' Dimensionals. I used 3 Black Enamel Dots on the left side of the circle. 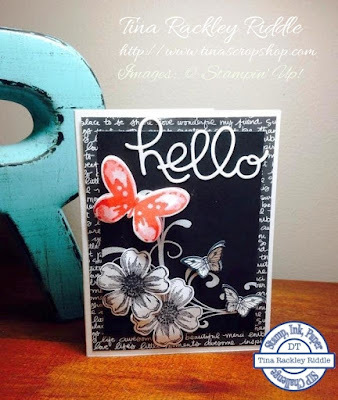 A strip of Basic Black Cardstock on the lower part of the card was glued on and the Sentiment was stamped from the Butterfly Basics Stamp Set with Real Red onto Very Vanilla and then banner ends were punched using the new Banner Triple Punch. I adhered the banner with the Stampin' Dimensionals onto the strip of Black cardstock. Hello! Hope you are having a wonderful week! Since I was off work on Monday, it has been a short work week for me and of course, it doesn't get much better than that! Well, except for vacation.... I need one of those soon! 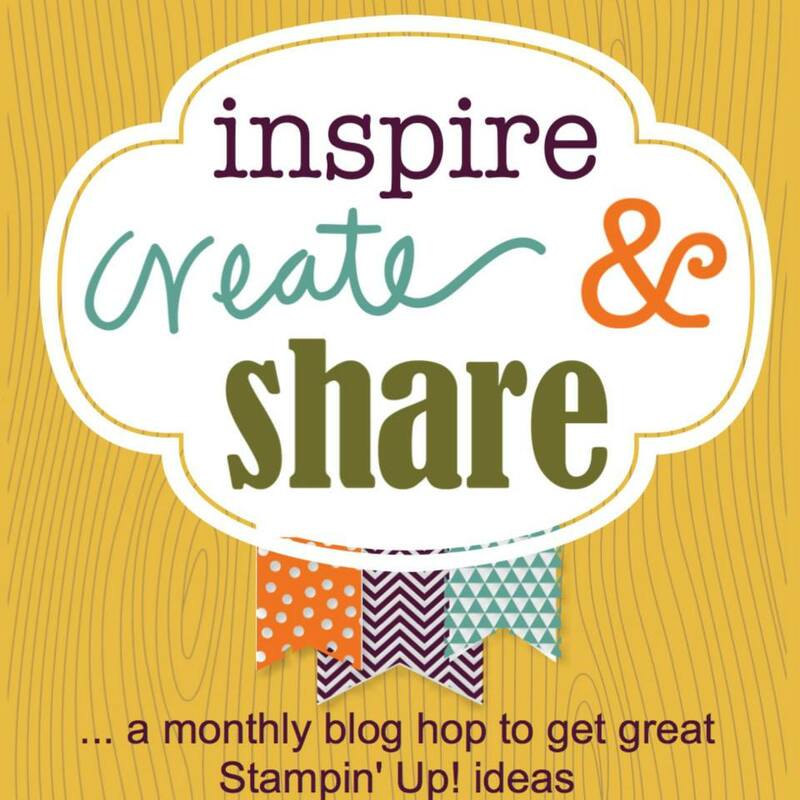 I'm so happy that it's time for another One Stamp At A Time Blog Hop! This is our biggest hop ever and we are so happy to have such talent included in our Hop! If you've already been hopping along, you should have landed here from the Fabulous Renee's blog! Isn't she amazing! Since this month's theme is Designer's Choice. and I recently received my Stampin' Up Holiday items, I couldn't resist trying out a some dies and stamps that I hadn't had a chance to play with yet! 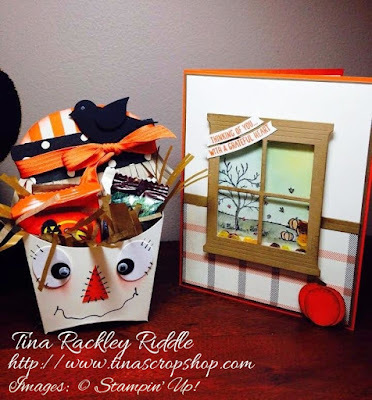 I have two cards to share with you using some of my new Holiday Catalog goodies! 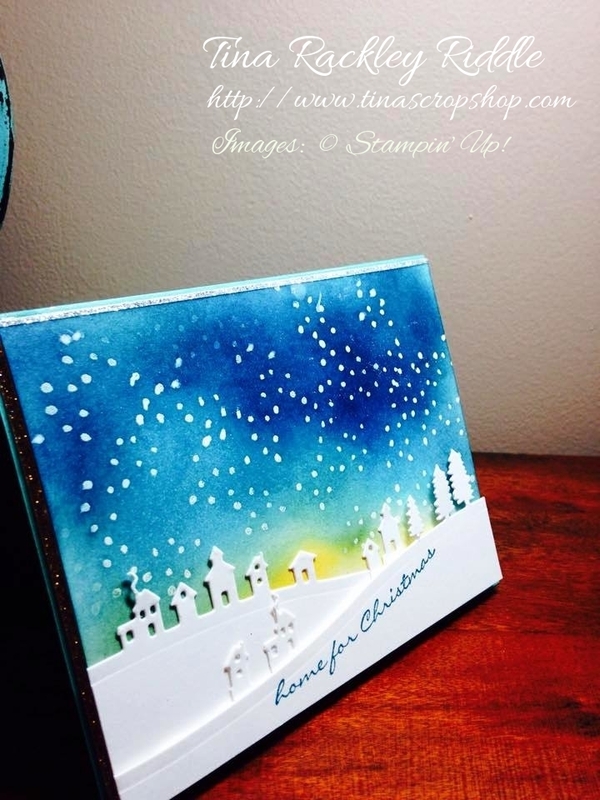 My first card uses the Sleigh Ride Edgelit Dies and Jingle All the Way Stamp Set for the sentiment and the snow. 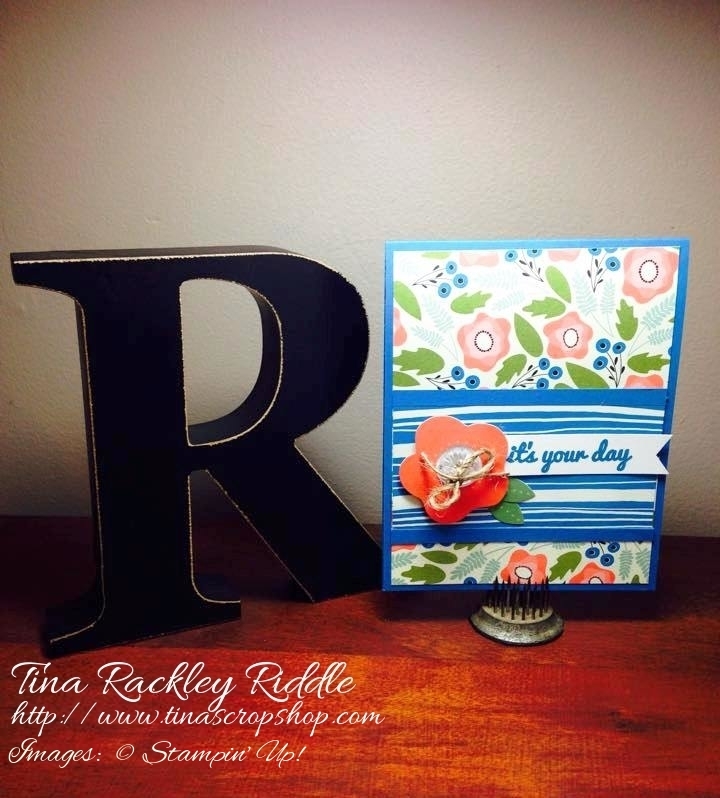 On this card I used Stampin' Up! Shimmery White Cardstock for the background. I embossed the snow with White embossing powder and then sponged on Yellow, Tempting Turquoise, Bermuda Bay, Island Indigo and just a touch of Night of Navy. I used the thick Whisper White cardstock for my Village and Tree Hillside scenes. I cut an extra Village slope so that I could cut off some of the houses to insert them in other places on my scene. I used the Home for Christmas sentiment in Island Indigo under the bottom slope. I mounted my scene on fun foam and then mounted that on a piece 4 1/8" x 5 3/8" Silver Glimmer Paper and that was then adhered to an A2 Bermuda Bay Cardbase. My second card uses the same Sleigh Ride Edgelits and Jingle All the Way Stamp Set along with the Hearth and Home Framelits for the window die and Hardwood stamp for the background. My top layer was Smoky Slate Cardstock that was stamped with the Hardwood Stamp with Smoky Slate Ink. For the background scene inside the window I used the same method as my first card but only used one of the slopes. Again, I cut two of the tree slopes so that I could cut off trees to add to the one slope that I used in my scene. After adhering the tree slope to the sponged background I stamped the dog (love love love this dog!!) onto the slope. I added a few dark brown spots on the dog so it would look more like my beagle! lol I then cut out the scene to fit inside my window die cut. For the sentiment I used the same sentiment as the first card but stamped it in Island Indigo on Whisper White cardstock and hand cut a sloped banner. I double scored right past the sentiment so it would fold and used my banner punch to banner cut the ends. I sponged the edges of the banner in Island Indigo. 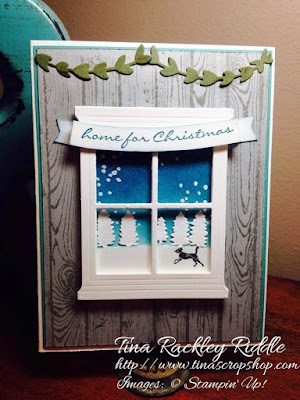 The Greenery at the top of the wall over the window is from Little B's Holiday Die Set. I am really loving these sets and am now officially excited about making my Christmas cards this year! I hope you enjoyed my cards. Next up is the incredibly talented Diane Squires blog! Just click the next button and you'll be there! Tina Riddle - You are Here! I decided to take this opportunity to make a card for my Granddaughter, Taylor. Her birthday is September 9th and her party is September 12th in Knoxville. Taylor is quite a little Diva so when I saw the Unity Stamp Co. Set "Casey (tiny fashionista)" I knew that I would use it for her card. 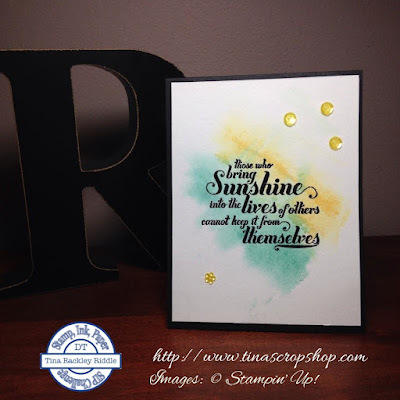 Products Used: Crest Solar White 110# Cardstock, Stampin' Up! Bermuda Bay Cardstock, Cherry On Top DSP, Unity Stamp Co. Casey (Tiny Fashionista) Stamp Set, Memento Tuxedo Black Ink, Stampin' Up! Bermuda Bay Ink, Copics, Stampin' Up! Rrhinestone Basic Jewels, Stampin' Up! Whisper White 1/2" Seam Binding, MFT Stitched Ovals, MFT Stitched Banners, Pink Wink of Stella, White Wink of Stella, Tombow Multipurpose Liquid Glue, and Stampin' Dimensionals. Have a Wonderful Week and don't forget to head over to SIP and link up your own card this week! Hello and Happy Saturday! I have a three day weekend so I'm pretty pumped! Right now I should be cleaning and organizing my craft room but I wanted to take a minute to show you a card I made for a friend. I think it came out so cute and I think she'll love it! First of all, I have to tell you that the stamps that came with the June Paper Pumpkin kit were so cute. I've been trying to think of some other ways to use them and as I was going through the Pretty Petals DSP this morning I noticed that some of the flowers were almost exactly like the Stamps as well as the little diecut flowers. Score! So here's what I came up with.. Both the background DSP and the strip of DSP were from the Pretty Petals DSP stack. I put a small band of Pacific Point DSP on each side of that strip and the card base was Pacific Point as well. 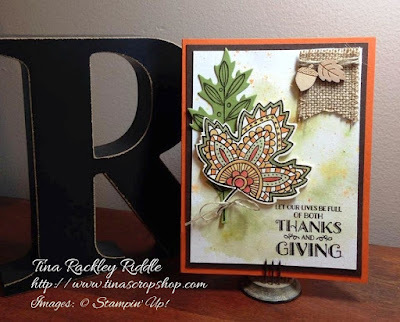 I used the Die Cuts from the June Paper Pumpkin Kit for the flower and the leaves. They were adhered with Stampin' Dimensionals. The twine and button in the center of the flower are from that kit as well and I used glue dots to attached the button. The sentiment.. yep, you guessed it, also from the June PP kit. Even the inside sentiment and small flowers that I stamped were from it. What a super easy and cute card this was to put together. I love when I can reuse parts from my Paper Pumpkin Kits. If you aren't currently a Paper Pumpkin subscriber, what are you waiting for? It is a adorable little package filled with pre-designed projects and comes with stamping spots as well as Stamps that as you can see, you can use for other projects. I highly recommend it! It is just $19.95 a month plus tax. Shipping is included in the price! If you go to www.mypaperpumpkin.com and use the code HALFOFF, you will receive 50% off your first two kits. What a deal and it just lasts until September 10th so hurry over to sign up! 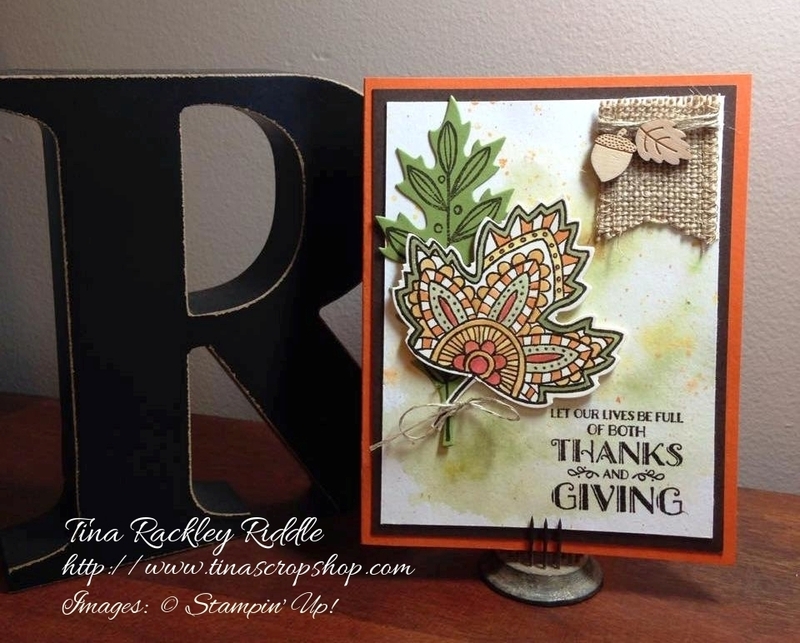 For my card I decided to go with a Thanksgiving/Fall theme with the beautiful Lighthearted Leaves Stamp Set. This set coordinates with the Leaflet Framelit Dies and has just so many possibilities. I started with an A2 card base of Pumpkin Pie cardstock. My top layer was Crumb Cake cardstock and two of the leaf images from Lighthearted Leaves were stamped tone on tone with Crumb Cake Ink. I also used the Crumb Cake Ink to sponge the edges of that layer. I heat embossed in White on the Shimmery White Cardstock the same two leaves and used my sponge daubers to apply the various shades of ink on them. The inks I used were Cajun Craze, Old Olive, Hello Honey, and Pumpkin Pie. After I had sponged the leaves, I used a paper towel to wipe off any ink film from the white embossing. I then cut the embossed and sponged leaves out using the Leaflet Framelits and used dimensionals to adhere them onto my card. The sentiment was stamped used Cajun Craze ink onto watercolor paper that had a watercolor wash of some of the leaf colors. I used my Lots of Labels Framelit Dies to cut out the sentiment. I added two Cajun Craze candy dots, one of each side of the label. I also added a bit of Gold Thread under the leaves and splattered some Gold glitter on to the background as well. I hope you've enjoyed my card and hop on over to the next stop to check out what the super talented Anna has for you! Just click the next button and you'll be at her blog! Hello and happy Tuesday! Not only have we survived Monday, but we have now officially survived August! It is so hard to believe that it is already the 1st of September! It has been a super hot summer here in Middle Tennessee so I'm ready for a cooler September! Well since it is Tuesday, you know what that means! Another SIP Challenge! 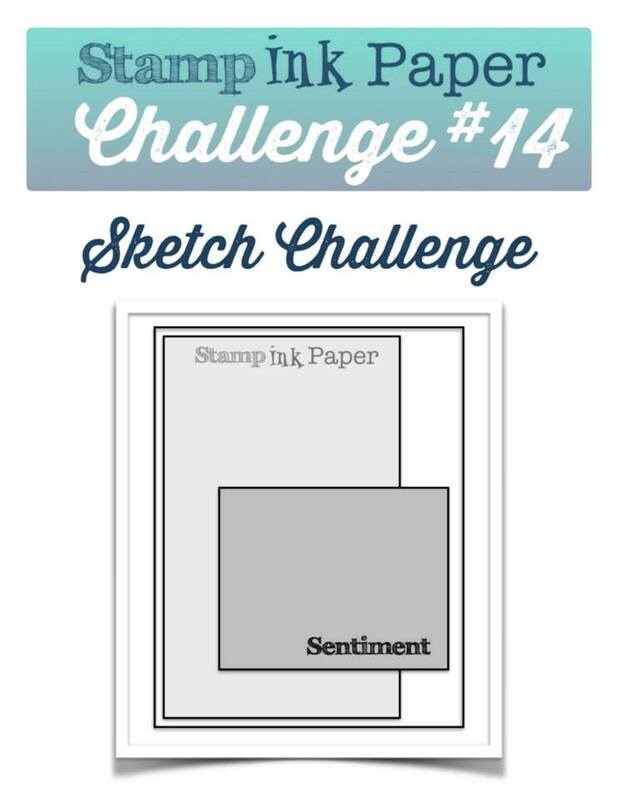 So welcome to Stamp, Ink, Paper Challenge #12! 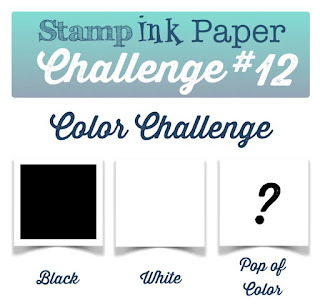 This week we have a Color Challenge that I really think is super fun.... Black, White, and a Pop of Color! For my "Pop of Color" I chose the New 2015-2017 In Color "Watermelon Wonder". It is one of my new favorites! I stamped off twice for the background of the butterfly to make it a very pale pinkish red. I stamped off once on the 2nd step, and stamped direct for step 3 of this beautiful butterfly! 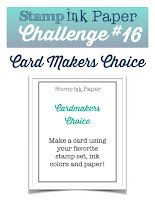 I also used some of the new Stampin' Up! Neutral Color Collection Paper Stack paper in Basic Black. I really love the new patterns this year! In my typical fashion I used part of a lot of Stamp Sets. The flourish is from "Everything Eleanor" and was heat embossed in White. The small butterflies are from "Papillion Potpourri" and stamped with Memento Tuxedo Black onto Whisper White cardstock and then punched out with the Bitty Butterfly punch. I doubled the layers so I could life the wings of the upper layer on all of the butterflies. The flower is from "Flower Shop" stamp set and punched out with the Pansy Punch. Last but not least, my pop of color was the large butterfly and is from "Watercolor Wings" stamp set and cut out with the Butterflies Thinlits Die. Last but not least, the "hello" sentiment is die cut on Whisper White cardstock with the "Hello You" thinlit dies. Whew.. that's a lot of stamp sets, dies and punches out! No wonder I have such a mess when I get done!